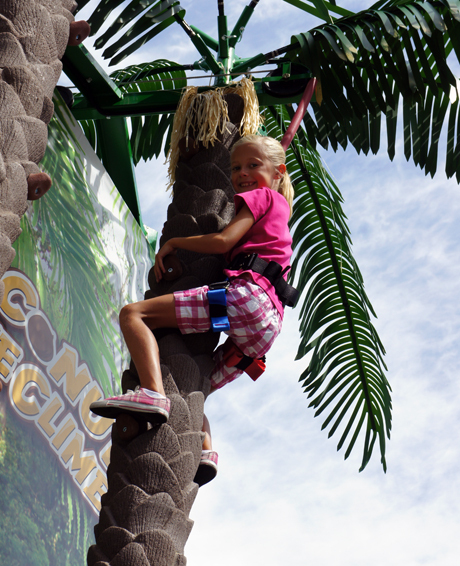 The mobile Coconut Tree Climb is a themed attraction that you can bring to your customer’s event that will provide a unique and memorable experience. These trees are fun and easy to climb with textured trunks to grab and additional bolt-on handholds every 2 feet (60 cm). The bolt-on handholds allow you to add or remove grips to adjust the skill level if needed. Climbers race against each other or against the clock (LED timer on the center tree). This themed attraction is sure to provided an experience your customer will never forget! Our mobile unit is designed for easy setup and is a completely self-contained attraction for convenient transportation. Setup can be accomplished in 20 minutes, and a hydraulic lift system does the hard work by raising the trees into position at the touch of a button. Palm fronds and banners are placed in secure boxes on the trailer during transportation and storage. Coconut Tree Climb rides on a full-size single-axle trailer for reliable towing. Dual-axle upgrades are available for those who prefer the tracking advantages and long-haul security of an additional axle. Our optional Folding Trailer Tongue raises the front portion of the trailer out of the way to reduce the footprint by 160 ft² for events that place a premium on space.